Technology has changed teaching at Boulder City High with every teacher using an iPad in their classroom. Roberts said teachers are using the iPads to video themselves teaching the day’s lesson or presentations at the front of the class. The video is then posted online to the school’s website, and students who were absent or want to review, can play the video and get caught up. It’s not just the teachers. Many students have iPads through a school-sponsored program aimed at putting the devices in all the students’ hands during the next few years. On the Nevada Education Department’s website regarding the School Performance Framework for Advance Placement Exams, Boulder City has improved passing scores each of the past three years. In 2010-11 Boulder City students passed AP exams at a rating of 42 percent. It climbed in 2011-12 to 53 percent. This past school year, with iPads in wide use, Boulder City students passed AP exams at a rate of 64 percent. The iPad program at Boulder City got its birth in 2010-11 when the school purchased a few. The program got in full swing last year when the school held a fundraising campaign and every student taking an Advanced Placement course was issued an iPad. Boulder City High’s enrollment is 641 students: 158 seniors, 154 juniors, 161 sophomores and 168 freshmen. The school has 31 teachers and one librarian. Beginning in August, students in the following classes were issued an iPad; AP U.S. history, AP world history, AP U.S. government, AP literature, AP language and composition, AP physics, AP Spanish, AP art, English 10 Pre-AP, AP chemistry, anatomy & physiology, Spanish III Honors and the specialized learning disabilities. Early concerns about iPads being broken or stolen have, so far, been unfounded. 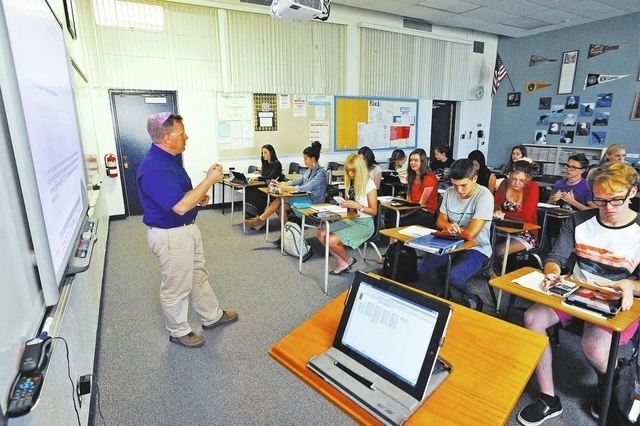 Boulder City High has 255 iPads on its campus and 224 of those are in the hands of students. Every teacher on campus also has an iPad. Some of those were issued by the school and some were purchased with specialized program money, such as career and technical education funds, Roberts said. There are a few other schools in Clark County using iPads. “Southwest Career and Technical Academy started their program about two years prior to ours and we actually talked to them quite a bit about the pros and cons and logistics of this type of program,” Roberts said.